Both convection and conduction vaporizers are healthier options than smoking, but they vaporize herb differently. This simple guide explains how each one works, and provides you with the advantages and disadvantages of each so you can make an educated decision before you buy. Confused about these two common vaporizer types? Both terms refer to how an individual vaporizer heats dried herb or oils. 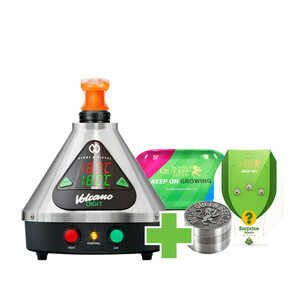 Convection vaporizers heat herb or concentrates indirectly with a forced stream of hot air until vapor is released. Conduction vaporizers use direct heat to vaporize the material. A heated surface, but not a flame, actually touches the herb or extract to create vapor. HOW DO CONVECTION VAPORIZERS WORK? With most convection vaporizers, you load weed into a removable chamber that sits inside or on top of the device. Once the vape reaches the desired temperature, you attach or insert the herb chamber and allow it to heat up for about a minute before vaping. What you do next depends on the type of convection vape you're using. Most convection vapes are still desktop models, and there are two primary types of units: balloon style and whip style. Some have multiple attachments so they can be used either way. With a balloon-style vaporizer, you attach a balloon to the herb chamber and turn on the fan to force heated air through the weed. This creates vapor that fills the balloon. Once full, you remove the balloon, turn off the vape, and enjoy at your leisure. With a whip-style convection vape, there is no fan. Instead, you breathe slowly through the whip so that your lung power draws the hot air through the herb, up through the tubing, and into your mouth. Both types of convection vapes are very efficient and present virtually no risk of scorched or burnt herb. That's apparent when you empty the herb chamber. The leftover material will be a dull brownish material that doesn't look or smell like it was combusted. Convection vapes are very efficient. They will vaporize nearly all of the cannabinoids in your weed. Many also offer precise temperature controls so you can set it as low as 105°C to get the health benefits of THCA, or turn it up as high as 220°C to get vapor filled with CBC from the same herb. Plus, the taste and smell is very different from any other type of consumption. It's so soft and smooth that even non-smokers can take full lung hits with ease. Some convection vapes only work with dried herb, but most come with an adapter for extracts as well. Easily split a single chamber full of herb into multiple sessions. Most can vape both dried herb and extracts. HOW DO CONDUCTION VAPORIZERS WORK? Conduction vapes require ground herb to be packed tightly into an integrated heating chamber where it comes into direct contact with the heating coil. With the push of a button, the unit will reach the set temperature within seconds, delivering an immediate draw. It's a much faster and simpler process compared to convection vaping. However, most conduction vapes don't heat the herb evenly. The material closest to the coil heats up the most, releasing the majority of its active ingredients immediately, while the herb furthest away is left pretty much intact. To prevent waste, you'll have to open the chamber several times during a session to stir the herb. The typical conduction vape is small and portable. A few models need to be plugged into the wall, but most newer units use rechargeable batteries. The battery life, for the most part, is directly related to the build quality of the unit. In other words, you get what you pay for. Because conduction vaporizers are relatively inexpensive, there are many models on the market. Some only have a few available temperature settings, but a few of the more high-tech units offer precise controls that are on par with convection vapes, allowing you to dial in the temperature to target specific cannabinoids and terpenes. Standard conduction vapes are designed to work with either dried herb or extracts, but multi-purpose units that come with two types of dedicated vaping chambers are also available. Choosing a vaporizer is a personal choice, so only you can decide which one will be a better fit. However, there are some cases where one type may be more ideal than the other. If you're on a tight budget or you need a very portable vape, go with a conduction vaporizer. This type will also be best if you don't want to mess around with a lot of different parts or wait up to 10 minutes every time you want to vape. However, if you vape mostly at home, want the best flavour, or you're vaping for health reasons, investing in a high-quality convection vaporizer could be the best choice. Royal Queen Seeds Now Accepts Crypto Payments! Is It Possible To Grow Organic Cannabis With Hydroponics?